As regular readers know, I’m a bit of a ‘foodie’ so I was expecting to really enjoy The Belly of Paris, (Le Ventre de Paris – also translated as The Fat and the Thin; Savage Paris; or The Markets of Paris). 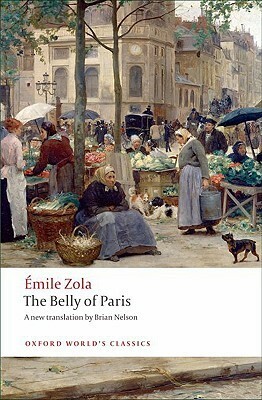 First published in 1873, it’s the 11th novel in the recommended reading order for Zola’s Rougon-Macquart cycle, and it’s set in Les Halles de Paris, the huge fresh food market in the heart of the city that was a mecca for food-lovers until it was (unwisely) demolished in 1971. Now, I like buying food, cooking food, admiring the presentation of food, and exploring different cuisines – but I am not especially interested in reading descriptions of food. And so while I recognise that The Belly of Paris is a favourite of many and it was the first time a food market had been used as a poetic symbol of bourgeois consumerism, I found myself becoming a bit tired of the descriptions of food which litter this novel. The plot, on the other hand interested me very much. The central character, Florent Quenu finds himself inadvertently caught up in an insurrection during Louis-Napoleon’s 1851 coup-d’état and falsely accused of murdering a young woman. He serves many years as a prisoner on the galleys at the notorious Devil’s Island, eventually escaping to Paris where he finds the city unrecognisable under Haussman’s urban reconstruction program. His half-brother Quenu takes him in, and despite his reservations about the gluttony symbolised by the markets, Florent eventually takes a position as an inspector at the fish market, reluctantly becoming part of the great market economy that was transforming Paris at the time. His inertia, and his disdain for money, decent clothing and the bourgeois values that underlie the expansion of the markets, place Florent in conflict with his family and the stallholders. Quenu’s wife Lisa is proud of the respectability of her charcuterie, and she is suspicious of anything or anyone that might sabotage it. (As well she might, given the political instability that characterised French history in this period). What Zola shows so cunningly in this book is the power of the mob. 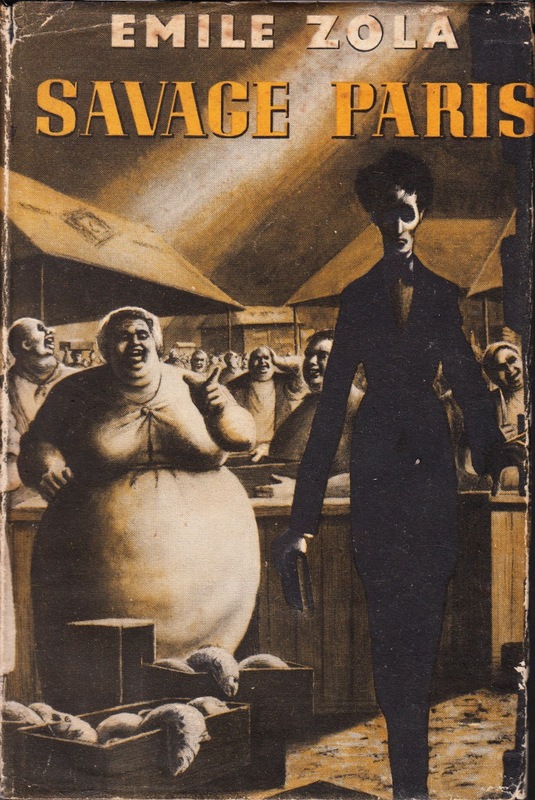 The plump, placid people of the market harbour doubts about Florent because he is thin – his very physique symbolises his rejection of The Good Life that they sell to Paris in their food stalls. While some of his actions are imprudent, it’s the whispering campaign that becomes a roar that leads to his downfall. Visit The Books of Emile Zola for Jonathan’s ‘Exceptional Excerpt’ to read a description of Lisa in her triumph, and check out Nancy’s review at Silver Season. The translation by Brian Nelson for the Oxford World’s Classics edition is excellent, and I really like the cover image which is a detail from The Square in Front of Les Halles by Victor-Gabriel Gilbert. It’s a remarkable contrast with my copy of the 1955 Elek edition cover at left, which emphasises Zola’s theme of the Fat in conflict with the Thin! (You can see more lurid and tasteless covers of this title in Jonathan’s amazing collection at The Works of Emile Zola). Gilbert’s lovely painting – which for some reason still has copyright restrictions so you can only view the complete painting by visiting one of the sites that sells prints of it is one of a series of paintings of the markets by Gilbert, and I was able to use the ones at Wikigallery since this blog is not a commercial site. I have used the collection to make the slide show below. There are also wonderful B&W photos of the markets here (click to enlarge each image). Source: Personal copy, purchased from Fishpond. This entry was posted in 1873, Émile Zola, Commentary, English, Lisa Hill (ANZ LitLovers), Nelson, Brian, No 11 and tagged Émile Zola, The Belly of Paris. Outstanding job with Gilbert’s paintings, Lisa. When I first got here, before I read the post, I thought you had found an illustrated edition of Le Ventre de Paris; they’re that perfect. I’m so glad you like them, I find them enchanting. My favourite is the one of the little boy. I just finished reading this, and so far, it is my absolute favorite! I’ve only read three in the series, however, so my opinion is not worth all that much. This book reminded me of how, unfortunately, human beings do not seem to be at our best if we are absolutely contented with every need and most desires fulfilled. We will fight to stay in this grub-like state of satisfaction if we somehow attain it, even if that means allowing or even committing atrocities, and tend to believe we deserve what we have and that others don’t. It’s interesting that now (in America anyway), it is now the thin who look down on the fat, and the fat are often poor and the thin rich. There are a lot of bellies in the US right now where I live, and they are terrifying. They are eating up our cities at a dizzying pace, pushing the middle class and the poor away from their traditional mainstays, like public transit and affordable inner-city housing close to their places of employment. In my city, we have our own Haussmans, razing the useful and the beautiful, the lively and historic to the ground and replacing it with disproportionately huge, sterile, ugly buildings covered in hot, glaring glass. When I go downtown, where I used to live, I see that ‘fatness’ on the new people’s faces. Many have nothing but contempt for those they’ve displaced, and even those who don’t go that far feel no remorse about it. Meanwhile, drugstores and shoe repair shops and diners and small family grocery stores disappear and are replaced by artisan yarn shops and places that sell donuts with sea salt and bacon on them. Our white patriarchs are also enjoying fat times, with their chosen president in office and less need to hide their true positions on things than there has been for years. Packishness and tribalism are on the rise all over the world – an unsurprising human response to the ever-mounting number of refugees being created by the combination of global capitalism and climate change (its by-product). So anyway, this novel really resonated, and it’s depressing how fresh it felt to me (unlike some of the fish and cheeses!). In Florent, I saw the first believable character from Zola who was not despicable. I would like to have seen him fleshed out a little more (no irony intended! ), but the style and structure of the book make it reasonable that he wasn’t. He was like a bug in a jar being carried along in a rushing current. I know what you mean about the food descriptions! I found myself thinking ‘uh oh’ whenever a character went into a part of the market that hadn’t already been described. 🙂 I did love the cheese-stink symphony though. And I feel like exhausting the reader was maybe Zola’s point with these descriptions – so much food! So much waste. Speaking of which, I thought you might enjoy these Pathé films of Les Halles from the ’20s and 1917 (respectively). I was having a hard time visualizing some of it, despite the minute descriptions – as a 21st century American, I simply lacked a frame of reference for such a thing. Do you think there is an American author with the stature of Zola who is documenting the state of things in the US today? I’m sorry for my delayed reply, Lisa! WordPress for some reason did not notify me of your reply to my comment. I hope you had (or perhaps are still having) a wonderful holiday. That is a really good question! I have to confess I shy away from contemporary American literature because our publishing now favors light reads, memoir, fantasy, or books that examine identity. The most recent Zola-stature American authors I can think of who skillfully skewered our nation’s folly straight through all the social strata are Sinclair Lewis (d. 1951) and Edith Wharton (d. 1937). My sister would argue that Kurt Vonnegut also belongs on this list (d. 2007) and maybe Tom Wolfe (d. 2018). I feel like there has to be someone else I’m not thinking of. Otherwise, how truly unfortunate. How about in Australia? I understand your country has avoided many of the pitfalls we’ve stepped into in America, but do you have any hawk-eyed social anatomists writing novels over there right now? I’d second that recommendation of Wharton and Sinclair Lewis – I read The Jungle many years ago and have never forgotten it. I hope people still read it today! I would say that we have the usual *yawn* commercial fiction preoccupations here too. Our best and most prolific socio-political novelists currently writing are David Foster, Richard Flanagan, Peter Carey, Rodney Hall, Eliot Perlman and Jane Rawson. Yes, they are mostly men, and that is because with rare but precious exceptions that don’t qualify for the adjective ‘prolific’, titles by our women authors are domestic a.k.a. relationships fiction, with occasional forays into issues of violence against women. There are a lot of angry feminist memoirs around too, and there’s a lot of interest in diversity – but not much interest in exploring structural and economic inequalities or environmental issues. The exception to this comes from a great generation of Indigenous authors, male and female, who are writing very powerful stuff see https://anzlitlovers.com/anzll-indigenous-literature-reading-list/ to get the picture, it’s much too diverse to cover in a comment here. And in New Zealand, it’s Lloyd Jones and Patricia Grace write powerful social novels too. Thank you for all the excellent recommendations! I have to confess I have not read much literature from Australia or New Zealand, and my knowledge is limited to Peter Carey and (maybe I should be embarrassed to admit this) Colleen McCullough. I’m intrigued by the description of David Foster’s work I found online, and by the indigenous authors in your post on your other blog, which I am looking forward to checking out (along with the rest of the blog!). ‘The Jungle’ was actually by Upton Sinclair, who unfortunately didn’t ever turn out another good book. I agree, it is a hugely important book, and I wish more people would read it! Unfortunately, the publisher of the most recent edition made the capital error of decorating the cover with closeup details of rancid cow carcasses, which can’t have helped sales. Sinclair Lewis is a fabulous social satirist, best known for ‘Elmer Gantry’ and ‘Babbitt.’ Reading his work (and Wharton’s) was an eye opener, because it made me realize Americans have been boisterous, overconfident, ignorant and credulous for a very long time. Before that, I liked to think we had gotten worse, but I think actually we just had more controls in place to protect us from ourselves. I did think of one good series by an American literary author that deals with the environment and climate change, and that would be ‘The Last Hundred Years Trilogy’ by Jane Smiley. Smiley is one of the best American authors writing right now. ‘The Greenlanders,’ a book she wrote in the early 2000s, gave me one of the most truly peculiar reading experiences I’ve ever had, in that she actually succeeded in adjusting my mental scheme to the expectations and pace of a 14th century Greenlander–or at least her representation of one. While I was reading the book, I felt like a different person. It was remarkable. Oops yes, I’m always mixing up Upton Sinclair and Sinclair Lewis and I shouldn’t because I’ve read Babbitt and they are totally different. I’ve read Smiley too, but only her campus novels. (I have a bit of a weakness for campus novels). The ones you mention sound great, I wonder why we haven’t heard much about them here, maybe because the only newspaper we have left that does book reviews is ideologically opposed to acknowledging climate change? Yes, it is a Murdoch publication! Katie, I like The Guardian too, but it’s not much good for Australian books which only rarely get reviewed. So I think we all rely on blogs now. I subscribe to blogs around the world, ones that are written by smart people who can write a review every bit as good as the ones we see in the press.